Charles Ross & Son Company Vice President of Corporate Operations Joseph Martorana announced the successful completion of the largest Ross manufacturing facility to date. Ross Wuxi Equipment, the company’s wholly-owned subsidiary in China, officially moved into its new 250,000-sq.ft. home on December 31, 2016, according to General Manager George Lu. A formal inauguration is scheduled for March 25, 2017. Ross Wuxi manufactures the world’s largest Planetary Mixers for pharmaceutical processing, High Speed Dispersers for the coatings industry, Multi-Shaft Mixers for adhesives production, and many other specialty mixing equipment for chemicals and various applications. Established in 1999, it has steadily captured the market share within China and neighboring Asian countries. In the last decade, the local battery industry powered mixer sales to even greater heights. 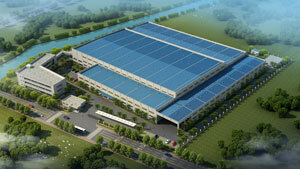 Despite several plant expansions, the exponential growth soon meant that Ross Wuxi needed more space. Construction of the new plant began in early 2016 while the company rented a nearby building to efficiently handle the continuing surge in orders. Today, Ross Wuxi has triple the manufacturing space it previously had and a workforce of 350 employees. A total of eight Ross facilities, all fully equipped with advanced engineering and manufacturing tools, are located around the US, China and India, including Charles Ross & Son Company in Hauppauge, NY which serves as corporate headquarters. Ross offers over 170 years of experience and leadership in industrial mixing, blending, drying and dispersion equipment for the process industries.